Railroads, roadsides, and fields, escaped from cultivation and not long persisting. First collected in 1905 in Wayne Co. In some plants (2-rowed barley) the lateral spikelets of each group of 3 are sterile; in others (6-rowed barley) the lateral spikelets are well developed and fertile. Both forms are found in disturbed ground in Michigan. The narrowly lanceolate glumes of this species are nearly always silky. MICHIGAN FLORA ONLINE. A. A. Reznicek, E. G. Voss, & B. S. Walters. February 2011. University of Michigan. Web. 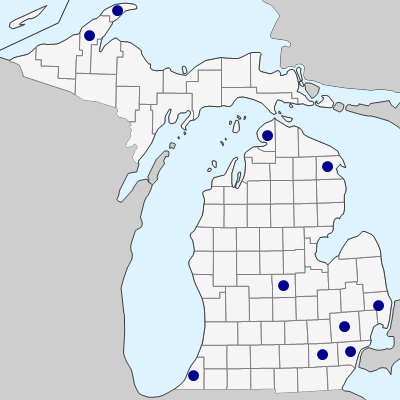 April 21, 2019. https://michiganflora.net/species.aspx?id=2139.